Things I am hearing about the Ferguson Grand Jury: It was a strange proceeding. Well, yes, because the purpose was different. Were these commentators hoping that the usual criticism of a grand jury ("That it will indict a ham sandwich if told to do so") would work in this case? I think that is a backwards idea. Grand Juries should not be knee-jerk and willing to indict. But, I can see that people who do normally think of grand juries as willing to indict a ham sandwich as feeling treated differently, here. Therefore, they are suspicious. How many corroborating items of testimony are needed before the grand jury will accept what it hears? There are plenty of things that can be interpreted differently. But there was irrefutable evidence that Mr. Brown had not taken the direction to get down on the ground as an order: merely it was a "suggestion." And that he was headed back toward the policeman by more distance than was consistent with a desire to stop and wait or get on the ground. Some commentators have mentioned the failure of any cross-examination of the policeman. But I haven't heard of any cross examination of anyone. That is an unresolved question. The furor over the verdict has to be understood in the context of police-community relations with African American communities throughout the country and over a long, long period of time. I agree that there may not be a realistic way to stop someone who "may be" about to attack, other than shooting. I do not know the reasons why police are trained to shoot at the center mass, or the head, but that does seem to increase the death toll. In this particular case, I think it is unlikely that a stun gun would have worked, if--in fact--Brown was returning the attack Wilson, again. Brown's size and weight would have made a stun gun shot questionable, and--of course-- pepper spray would have no effect. Unfortunately, we are not always given good choices. I was deliberately undecided until the grand juries report came out. The blood drops pattern probably pushed me over the line. Is there any explanation of a pattern of drops going away from the police, but the turning around and starting to return? I haven't heard one. On CNN someone tried to change the subject (IMO) and call the drops "splatter" but that is not what they were. If the pattern had been that the blood drops stayed in one place, I would find it much easier to believe that there was no threat, and that shooting was not necessary. I am not sure of what effect the fanciful testimony from bystanders had. For example, Brown was not shot in the back. I happen to believe that cameras will make a difference. A pilot project near here reduced episodes of force a lot and complaints even more. BUT, if a family or a community simply cannot accept the use of force as proper, there will be all sorts of ingenious attacks on the camera. Some ludicrous, but also some that could possibly be true. It will not solve all problems. The blog presented the argument against a "ham sandwich" indictment very well, but it also illustrated why, in a high profile case, whatever the prosecutor decides to do will be "wrong" according to some people. (By the way, I describe the blog as argument, because there was no evidence presented.) If there had been a "ham sandwich" presentation, we would have heard a lot about "what is being concealed?" I also have question as to how little a prosecutor could present to a grand jury with a "straight face." I am sure there will be a trial somewhere down the line, so I a not very concerned about non-cross-examination of Wilson (I still have no idea whether others were not cross examined). There is some value in getting Wilson's testimony --and others' --down under oath fairly early. Some of what I have read suggests that no-one was cross examined. That suggests a procedural decision, not a decision to avoid cross examination. I am puzzled by this criticism. What do the critics think? that Wison's testimony would fall apart like a witness on the old Perry Mason show? A lot of his testimony was corroborated by the physical evidence (relative sizes, and weights, the blood trail, Brown's failure to get down on his knees.) The whole criticism sounds a bit like a grab at straws. Brown was shot twice reaching into the car to grab Wilson's gun. The wounds were inconsequential and did not stop Brown from deciding to charge Wilson. Wilson hit him two more times. Neither wound appears to have been serious and Brown kept coming. It wasn't until the last two hits that Brown actually stopped. He fired twice during the initial struggle for his piece. He then instructed Brown to submit. Brown did not submit, but attacked. Wilson fired a second sequence of rounds, not apparently neutralizing Brown, but causing him to halt, still standing. He then again instructed Brown to submit. Brown continued to attack, finally being neutralized by the last shot in the third sequence. Wilson's training in fact appears to have been very good. Mind you, I rather suspect that most of those rioting (not counting those who are just in it for the looting) still believe the entirely false "facts" which circulated early and often- that Brown was shot with his hands up, that he was shot in the back etc. Portia, why are you convinced that there will be a trial "down the line?" So I am wondering what the threshold of acceptability for deadly action here is, because there are some posters here who don't seem to disapprove of ANY shooting of a black male under any circumstances. How, for example, will you justify this recent killing in Cleveland? A 12 year old boy takes a toy pistol to a park, another park-goer gets concerned and calls 911, but says TWICE that the person is a juvenile and that the gun is most likely fake. The police arrive in the scene and within two seconds the boy is shot dead. some posters here who don't seem to disapprove of ANY shooting of a black male under any circumstances. Scurrilous (but unsurprising). One could just as easily, and unjustifiably, refer to some posters here as disapproving of any white defending himself from a black attacker under any circumstances. In that case, assuming the press reports are correct, the police were trigger-happy idiots and I hope they're prosecuted, and the department sued. The reports I have heard include the apparent fact that the police were not told that the caller had said it is probably a fake gun. I believe that makes a difference. Also, have you seen pictures of the gun? It looks real to me. If the kid was waiving it around, shooting is tragic, but the right response. This reminds me of a discussion we had several years ago about a 92 year old woman who was shot when waiving round a gun. Pulling a trigger on a gun is easy. A 4-year old can do it. Why not a seven year old. I blame the parents, much more. they apparently didn't teach the kid how to handle the gun, and who took off the orange tip that showed it was a fake? There are plenty of circumstances where shooting a person (whatever color) is wrong. These are not getting much publicity lately. I started on a search for info on how many white people were shot by police and the first item that came up on the search results was a "non-white" police man who shot a white man who failed to stop and put his hands up. It happened recently in Salt Lake City. I almost fell off my chair when I heard the Brown's attorney refer to Michael as a "child." CHILD? he was about 6ft 5 or more and weighed 270 plus pounds and was starting a post-high school program the next day. Dam___t description of a Child I ever heard. Unfortunately, so many people seeming to approve of defying a police order may encourage others to do it too, and result in more deaths. The "police" were told that the gun was likely fake. The dispatcher is part of the police department. If that information was not transferred to the officers on the scene , that is still a failing of "the police". I would think this information would be very relevant. And the boy was not waving the gun at the time he was shot, the gun was in his waistband, and the officers felt he was reaching for it. I just think they could have spent more time than 1.5 seconds assessing the situation before shooting the kid. Minardil wrote: The "police" were told that the gun was likely fake. The dispatcher is part of the police department. Is the dispatcher a police officer? Minardil wrote: And the boy was not waving the gun at the time he was shot, the gun was in his waistband, and the officers felt he was reaching for it. That is not what the report you linked to says. "Police have said Tamir reached into his waistband and pulled out the weapon." The dispatcher is certainly PART of the official apparatus for emergency response. Are you suggesting that the information - the ACCURATE INFORMATION - that the gun was a fake was not important? Claiming that the dispatcher may not TECHNICALLY be a part of the police department seems like a pretty thin thread from which to hang your absolution of responsibility. Portia said that he was waving the gun around, he was not. The first reports from the police said he was shot while reaching for the gun, so there may be some disconnect there as often happens from one report to the next, but none of the reports claim that he make any threatening moves toward the police or pointed the weapon at the officers at any time. And frankly, he doesn't see to have much of an opportunity, since he was shot less than two seconds after the police opened their car doors. Apparently, he was waiving the gun around, earlier. I recall seeing pictures. Since it takes almost no time to shoot, I am not sure that where he was wearing the gun was relevant. Especially as he was told to drop it and didn't. If the police on the scene were not told that someone thought the gun was fake, the idea is not relevant. I am sure we have all heard the adage that there is "no such thing as an unloaded gun." And kids of that age shoot often, unfortunately. I think the parents have at least equal blame for letting him have such a realistic gun (and maybe allowed him to take off the orage tip) and for not giving him lessons in how to behave around guns. So are open carriers, waving their guns to be shot on sight then? Or only 12 year old black kids with toy guns? The video shows the cops shooting him within 2 seconds of pulling up and opening their doors. Are you really certain that this is enough time for them to demand that he drop the weapon TWICE? And since he didn't have the weapon in his HAND, how could he DROP it without first removing it from his waistband? And I don't see how you ignore the fact that the caller TOLD the operator that the gun was fake. This information should have been given the police officers, so that they could respond properly. Back to the Michael Brown case, I am not nearly as sympathetic to that situation, Brown was a very large man - though not significantly larger than Darren Wilson - and there was obviously some physical altercation between the two, but even there, Brown was unarmed. Wilson had the option of using non-lethal force against Brown, but chose to use his side arm. Indeed, Wilson says he never carried his TASER, because it was "bulky and uncomfortable". In other words, Wilson made a deliberate choice to remove even the OPTION of using non-lethal force. Likewise Wilson said that his can of Mace was out of reach, so again, he had made a choice - keeping his mace in a location where he could not get to it - that removed non-lethal force from his options, leaving him ONLY with his gun. THAT has to be wrong. An officer should be able to act with lethal force if necessary, to protect both himself and others, but he should ALSO be able to act with NON-LETHAL FORCE when the situation calls for it. Wilson should not be able to remove non-lethal options from his arsenal, and he should be trained to think of using non-lethal force WHENEVER possible, with deadly force only when absolutely necessary. Policeman are not Soldiers who's only job is to kill the enemy by whatever means possible. Policemen are officers of the law, their function is to serve and protect EVERYONE, including the people they have to arrest. 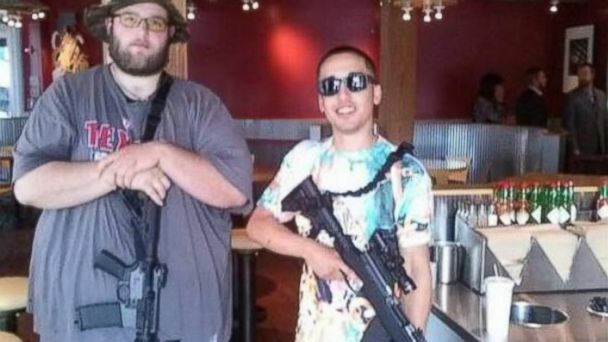 Hey, those Open Carry dudes who go shopping with their assault weapons slung across their backs are God Fearing American Patriots, probably Job Creators - who are merely exercising their 2nd Amendment Rights and when they troop into Denny's or Chic-Fil-A with their guns held at the ready they are just showing us how safe and non-scary heavy weaponry is. A little black boy with a toy gun, on the other hand, is a menace to society, probably a socialist who hates America anyway, who should be immediately shot on sight. The dispatcher is certainly PART of the official apparatus for emergency response. Is the dispatcher a police officer? It is a simple question Minardil. Can you actually answer it? Are you suggesting that the information - the ACCURATE INFORMATION - that the gun was a fake was not important? I did not suggest anything, Minardil. I asked you a question about your claim. Although it is interesting that your assertion has gone from "likely" to "was" regarding what was known. Claiming that the dispatcher may not TECHNICALLY be a part of the police department seems like a pretty thin thread from which to hang your absolution of responsibility. I don't recall giving any absolution of responsibility. I do recall asking you a question about what you wrote, and pointing out you making assertions not supported by the report you provided. In fact I think I am holding you responsible for your assertions. Portia said that he was waving the gun around, he was not. I did not ask what Portia said. I addressed your assertion, which was not supported by the report you linked to. The first reports from the police said he was shot while reaching for the gun, so there may be some disconnect there as often happens from one report to the next, but none of the reports claim that he make any threatening moves toward the police or pointed the weapon at the officers at any time. And frankly, he doesn't see to have much of an opportunity, since he was shot less than two seconds after the police opened their car doors. There is some disconnect, but that is between your assertion, and the link you provided. There is also some disconnect between your assertions from one post to the next. Here we go, the apologists for child murder are turning up. So, here's another case, where the police arrived on the scene to confront a black man waving a gun around in public, and they shot him dead immediately. Most of that sentence is true, except it was a white guy, and they didn't shoot him, the talked to him and eventually confiscated his gun overnight before returning it to him the next day. Personally, this sounds like the way this sort of situation should be handled, so why was a 12 year old boy shot dead immediately? I am sure there are a lot of shoot now, think later situations with police shooting--and of course non-police shooting, but we need to be aware that some are well founded. We need not to "knee jerk" a reaction that something is not well founded. Sometimes the available evidence indicates that it was, at least, a questionable situation. And we have to separate events that were really discrimination from things that possibly were not, but have symbolic value. I herd Chris Rock say on "60 minutes" that it is always Black people who are shot. That is not merely wrong, but absurd. Even with ordinary comedic exaggeration, it is an improper thing to say. There was an event in Salt Lake City, recently where a white man ran away, even though his brothers stopped. He came back, and was shot. He was unarmed. There was some suggestion that he might have been intending to commit suicide by cop--not an unknown attitude. However, what might he have done in order to force the cop to shoot him? And doesn't that strike you as something that we should consider to be an issue that needs to be addressed and corrected? Rather than saying "Oh, those police officers in Cleveland had reasonable cause to shoot a 12 year old boy with a toy gun", shouldn't we be pushing them to adopt non-lethal measures as an alternative to opening fire almost immediately as they did in this instance? And when they end up using deadly force on someone who turns out never to have been a threat, shouldn't we hold them accountable if they have behaved recklessly, as they did in this case? Either that, or you need to be upset at the police for NOT killing that crazy white dude the minute they showed up. And certainly the PERCEPTION in the Black Community is that EVERY encounter with the police, even the most routine traffic stop, has the potential to turn deadly in an instant, and many black parents feel the need to teach their son's how to behave when talking to a cop, just so they don't get shot, and this is something I never had to learn when I was growing up, nor have I felt the need to give my own 14 year old son any such instruction. Gee, might that have something to do with the fact that black males in the US commit crimes at a hugely disproportionate rate? You sure about that? What about these two morons in a Chipotle?? Sorry, MB, not one of those is an assault rifle. But no matter what you call these particular class of long guns, the truth remains that these are REAL, ACTUAL GUNS, and the Open Carry folks are NOT just walking about with them slung over their backs, they are actually carrying them in the ready position, as the picture shows quite clearly. The kid who was killed in Cleveland was carrying a toy, which just looked like a gun. Our question, was, why aren't these Open Carry folks shot on sight, just for having a gun in their hands, like this kid in Cleveland was?